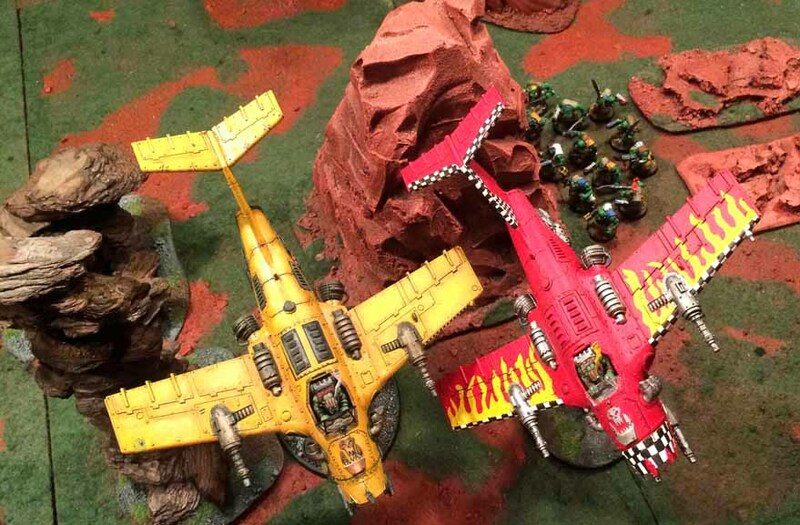 The ork Dakkajet is greatly feared by Imperial troops for its devastating firepower. These two xeno aircraft are conducting a strafing run during the Fourth Battle of the Iron Spires. Rumlar had just left the hangar deck (striding all the way), and Shmitty his Big Mek and Chief Injinseer (read more) had promised him more fast-moving dakka. He knew just where to send it. TheGaffer/Orks: TheGM has had it fairly easy in picking his forces. (Actually we both have, since our collections are still relatively small.) I’ve pretty much played the same army all year, although TheGM has been adding all sorts of shooty bits to his, and he’s been able to change his force each game to stymie my orks. My three small mobz of Boyz have had little staying power and lately TheGM was able to shoot me up good and proppa’, leaving me with little to hold objectives near the end of a game. The holiday break gave me the opportunity to paint up more Boyz. I’ve wanted to try the Ork Warband detachment to give me some army-special rules to add to the ork’s abilities. TheGM has all sorts of additional rules for his platoon and company commanders to make his army very shooty, but the Warband will allow me WAAAGH! moves every turn after the first. I started with my six mobz of Boyz, one each of Gretchin and Nobz, a Mek, and, of course, a Warboss. Once that was done, I added two Trukks and a Rokkit Laucha mob. That left enough for two Dakkajets with an extra supa-shoota each. I had also brought along my collection of terrain to make sure I had at least some cover on the table to block lines of sight. TheGM/Imperial Guard: Hmm. My first concern is the Gaffer’s aircraft. They fire a lot of high-power shots, and each strafing run can kill a unit of Imperial Guard per turn. I’ve got to take them out. I need a Hydra anti-aircraft gun, but I don’t have one. So I’m going to have to count on a lot of Snap Shots. That means loading up on lascannon, auto cannon, and heavy bolters. I’d rather these weapons were aimed at the ork hordes marching toward me, but I’ve little choice right now. I’m going to go infantry heavy, with what’s I hope is a winning tactic: I’ll use cheap special weapons squads as “speed bumps” to slow the orks and give me another round of fire. If possible, I’ll also send up my veterans with shotguns. If the orks hit the speed bump and wipe it out, the orks will be just sitting there for a counterattack, led by three flamers and 14 shotgun blasts before I charge and get 20 melee attacks. This will be the first real chance I’ve had to go toe-to-toe with the orks up close. Those veterans will be in a Chimera. I can use that to rush up to the central objective—after I’ve whittled down the orks a bit. I’ll add an ordinance officer to my company HQ—a large blast bombardment every turn can’t turn. To bolster my infantry, I’ll add two Lemon Russ tanks. I can take out trucks and then the infantry in them. The battle would, once again, take place at the Iron Spires. 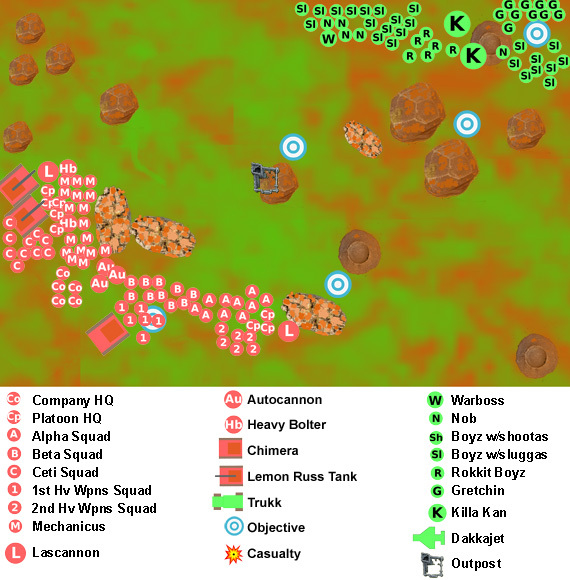 To make any headway in the campaign, TheGaffer needs to break through at this point on the map. He has had little luck getting through the Sea of Dust. The open ground there allows the TheGM to tear apart orks before they can close with any numbers. The Iron Spires will allow more cover on the table. We rolled for mission and objectives and got our “favorite” table set up: Vanguard Strike! The scenario, “Big Guns Never Tire,” will have five objectives. However, it was not meant to be. The dice were kind to TheGM, and he took advantage of that to set terrain pieces that offered little cover in the center of the board. We deployed our objectives. TheGM placed two on his side of the board, and TheGaffer put two on his side and one forward, near the center of the board. TheGaffer/Orks: This will be the first deployment of an ork warband formation that will allow me a WAAAGH! move each turn after the first. I’ve painted up some additional Boyz, but I will still have only six small mobz. The idea is they won’t last long under intense fire, but I should have enough to attack in waves. With the open terrain in the center, I’m going to keep some back and move forward a little later in the game, once the jets come on the board and soften up the Imperials. TheGM/Imperial: My infantry is deployed in a long firing line, with two Leman Russ tanks on one flank and my flame-thrower equipped Chimera and shotgun-wielding Veterans deployed in the center as an on-board reserve. I’ve taken some heavy firepower in the form of auto cannons, heavy bolters, and las cannon. I’ve also got an ordinance officer to call in artillery. We’ll see if we can smash the ork charge—then rush out and seize the central objective before the end of the game. Of course, first I’ve got to take out the Dakkajets—fast. I hope I roll lots of 6s. Historical Note: The Fourth Battle of the Iron Spires was fought on 3 010 736.M41. A significant number of orks have been held in reserve. 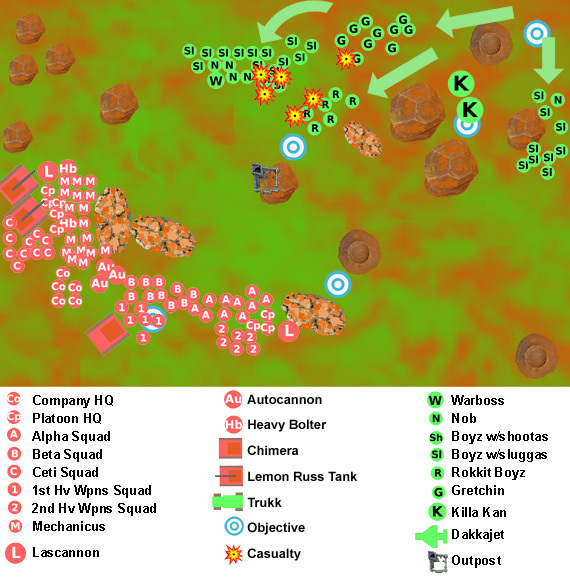 First forward are the Tankbusta’ Boyz (Rokkit Launchas), using the first turn’s nighttime rule as cover to run toward the center to seize an abandoned science station that can be used as a fortified firing base. Meanwhile, on each flank, a mob of Boyz begin to advance across the red Hegria desert in the pre-dawn hours. The Imperial Guard has few targets in the dark. The company commander’s ordinance officer calls in a bombardment, but the shells fall short of the enemy. On the right flank, the Imperial tanks see a hint of movement in the dark and open fire at the Rokkit Boyz and kill two, while a las cannon hits the ork Warboss but fails to wound. A volley by heavy bolters and auto cannon kill three more orks and a gretchin. Click here to read what happens next. The Corvus Cluster is a hobby blog that focuses on wargaming adventures in the Warhammer 40K universe.